Arlo Davy Guthrie (born July 10, 1947) is an American folk singer-songwriter. Like his father, Woody Guthrie, he is known for singing songs of protest against social injustice. Guthrie's best-known work is his debut piece, "Alice's Restaurant Massacree", a satirical talking blues song about 18 minutes in length that has since become a Thanksgiving anthem. His only top-40 hit was a cover of Steve Goodman's "City of New Orleans". His song "Massachusetts" was named the official folk song of the state in which he has lived most of his adult life. Guthrie has also made several acting appearances. He is the father of four children, who have also had careers as musicians. Guthrie was born in Brooklyn, New York, the son of the folk singer and composer Woody Guthrie and Marjorie Mazia Guthrie. His sister is the record producer Nora Guthrie. His mother was a one-time professional dancer with the Martha Graham Company and founder of the Committee to Combat Huntington's Disease, the illness from which Woody Guthrie died in 1967. Arlo's father was from a Protestant family and his mother was Jewish. His maternal grandmother was the renowned Yiddish poet Aliza Greenblatt. Guthrie received religious training for his bar mitzvah from Rabbi Meir Kahane, who would go on to form the Jewish Defense League. "Rabbi Kahane was a really nice, patient teacher," Guthrie later recalled, "but shortly after he started giving me my lessons, he started going haywire. Maybe I was responsible." Guthrie converted to Catholicism in 1977, before embracing interfaith beliefs later in his life. Guthrie attended Woodward School in Clinton Hill, Brooklyn from first through eighth grades and later graduated from the Stockbridge School, in Stockbridge, Massachusetts, in 1965. He spent the summer of 1965 in London, eventually meeting Karl Dallas, who connected Guthrie with London's folk rock scene and became a lifelong friend of his. He briefly attended Rocky Mountain College, in Billings, Montana. He received an Honorary Doctorate from Siena College in 1981 and from Westfield State College in 2008. As a singer, songwriter and lifelong political activist, Guthrie carries on the legacy of his father. He was awarded the Peace Abbey Courage of Conscience award on September 26, 1992. On Thanksgiving Day 1965, while in Stockbridge, Massachusetts, on vacation from his brief stint in college, Guthrie, then 18 years old, was arrested for illegally dumping on private property what he described as "a half-ton of garbage" from the home of his friends Ray and Alice Brock after he discovered the local landfill was closed for the holiday. Guthrie and his collaborator appeared in court, pled guilty to the charges, were levied a nominal fine and picked up the garbage that weekend. This littering charge would soon serve as the basis for Guthrie's most famous work, "Alice's Restaurant Massacree", a talking blues song that lasts 18 minutes and 34 seconds in its original recorded version. Guthrie has pointed out that this was also the exact length of one of the famous gaps in Richard Nixon's Watergate tapes. The Alice in the song is Alice Brock, who had been a librarian at Arlo's boarding school in the town before opening her restaurant. She now owns an art studio in Provincetown, Massachusetts. The song lampoons the Vietnam War draft. However, Guthrie has stated in multiple interviews that the song is more an "anti-stupidity" song than an anti-war song, adding that it is based on a true incident. In the song, Guthrie is called up for a draft examination and rejected as unfit for military service as a result of a criminal record consisting in its entirety of one crime, littering. Alice's restaurant is the subject of the recurrent refrain, but is not mentioned in the story (early drafts of the song explained that the restaurant was a place to hide from the police). On the DVD commentary for the 1969 movie, Guthrie stated that the events presented in the song all actually happened (others, such as the arresting officer, William Obanhein, disputed this, and Guthrie now notes that he embellished some minor details). "Alice's Restaurant" was the song that earned Guthrie his first recording contract, after counterculture radio host Bob Fass began playing a tape recording of one of Guthrie's live performances of the song repeatedly one night in 1967. For a short period after its release in 1967, "Alice's Restaurant" was heavily played on U.S. college and counterculture radio stations. It became a symbol of the late 1960s, and for many it defined an attitude and lifestyle that were lived out across the country in the ensuing years. Its leisurely, sassy finger-picking acoustic guitar and rambling lyrics were widely memorized and played by irreverent youth. Many stations in the United States have a Thanksgiving Day tradition of playing "Alice's Restaurant". A 1969 film, directed and co-written by Arthur Penn, was based on the true story told in the song, but with the addition of a large number of fictional scenes. This film, also called Alice's Restaurant, featured Arlo and several other figures in the song portraying themselves. The part of his father Woody Guthrie, who had died in 1967, was played by an actor, Joseph Boley; Alice, who made a cameo appearance as an extra, was also recast, with actress Pat Quinn in the title role (Brock later disowned the film's portrayal of her). Despite its popularity, the song "Alice's Restaurant Massacree" is not always featured on the set list of any given Guthrie performance. Since putting it back into his setlist in 1984, he has performed the song every ten years, stating in a 2014 interview that the Vietnam War had ended by the 1970s and that everyone who was attending his concerts had likely already heard the song anyway, so (after a brief period in the late 1960s and early 1970s when he replaced the monologue with a fictional one involving "multicolored rainbow roaches") he decided only to do it on special occasions from that point forward. The "Alice's Restaurant" song was one of a few very long songs to become popular just when albums began replacing hit singles as young people's main music listening. But in 1972 Guthrie had a highly successful single too, Steve Goodman's song "City of New Orleans", a wistful paean to long-distance passenger rail travel. Guthrie's first trip on that train was in December 2005 (when his family joined other musicians on a train trip across the country to raise money for musicians financially devastated by Hurricane Katrina and Hurricane Rita, in the South of the United States). He also had a minor hit with his song "Coming into Los Angeles", which was played at the 1969 Woodstock Festival, and success with a live version of "The Motorcycle Song" (one of the songs on the B-side of the "Alice's Restaurant Album"). In the fall of 1975 during a benefit concert in Massachusetts, Arlo Guthrie performed with his band Shenandoah in public for the first time. They continued to tour and record throughout the 1970s until the early 1990s. Although the band received good reviews, it never gained the popularity that Guthrie did while playing solo. This band is not to be confused with the popular country music group Shenandoah, an entirely different group that had musical hits from 1986 to 2006. Arlo Guthrie's band Shenandoah consisted (after 1976) of David Grover, Steve Ide, Carol Ide, Terry A La Berry and Dan Velika. Guthrie's 1976 album Amigo received a 5-star (highest rating) from Rolling Stone, and may be his best-received work. However, that album, like Guthrie's earlier Warner Bros. Records albums, is rarely heard today even though each contains strong folk and folk rock music accompanied by widely regarded musicians such as Ry Cooder. 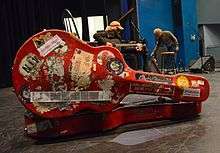 A number of musicians from a variety of genres have joined Guthrie onstage, including Pete Seeger, David Bromberg, Cyril Neville, Emmylou Harris, Willie Nelson, Judy Collins, John Prine, Wesley Gray, Josh Ritter, and others. Though Guthrie is best known for being a musician, singer, and composer, throughout the years he has also appeared as an actor in films and on television. The film Alice's Restaurant (1969) is his best known role, but he has had small parts in several films and even co-starred in a television drama, Byrds of Paradise. Guthrie has had minor roles in several movies and television series. Usually, he has appeared as himself, often performing music and/or being interviewed about the 1960s, folk music and various social causes. His television appearances have included a broad range of programs from The Muppet Show (1979) to Politically Incorrect (1998). A rare dramatic film part was in the 1992 movie Roadside Prophets. Guthrie's memorable appearance at the 1969 Woodstock Festival was documented in the Michael Wadleigh film Woodstock. 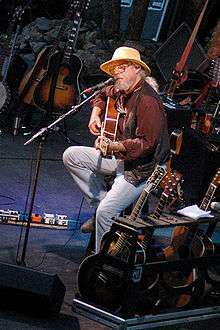 Guthrie also made a pilot for a TV variety show called "The Arlo Guthrie Show" in February 1987. The hour-long program included story telling and musical performances and was filmed in Austin, Texas. It was broadcast nationally on PBS. Special guests were Pete Seeger, Bonnie Raitt, David Bromberg and Jerry Jeff Walker. In earlier years, at least from the 1960s to the 1980s, Guthrie had taken a decidedly leftist approach to American politics. In his often lengthy comments during concerts his expressed positions were consistently anti-war, anti-Nixon, pro-drugs and in favor of making nuclear power illegal. However, he apparently regarded himself as more an individualist than the major youth culture spokesperson he had been regarded as by the media, as evidenced by the lyrics in his 1979 song "Prologue": "I can remember all of your smiles during the demonstrations, ... and together we sang our victory songs though we were worlds apart." A 1969 rewrite of "Alice's Restaurant" pokes fun at then-former President Lyndon Johnson and his staff. In 1984, he was the featured celebrity in George McGovern's campaign for the Democratic presidential nomination in Guthrie's home state of Massachusetts, performing at rallies and receptions. Guthrie identified as a registered Republican in 2008. He endorsed Texas Congressman Ron Paul for the 2008 Republican Party nomination, and said, "I love this guy. Dr. Paul is the only candidate I know of who would have signed the Constitution of the United States had he been there. I'm with him, because he seems to be the only candidate who actually believes it has as much relevance today as it did a couple of hundred years ago. I look forward to the day when we can work out the differences we have with the same revolutionary vision and enthusiasm that is our American legacy." He told The New York Times Magazine that he is a Republican because, "We had enough good Democrats. We needed a few more good Republicans. We needed a loyal opposition." Commenting on the upcoming 2016 election, Guthrie identified himself as an independent and said he was "equally suspicious of Democrats as I am of Republicans". He declined to endorse a candidate, noting that he personally liked Bernie Sanders despite disagreeing with Sanders's platform, and he admired Donald Trump's ability to not rely on campaign donations but did not believe Trump has the best interests of the country in mind. About once a month, Guthrie posts short writings to the Announcements area of www.arlo.net, often expounding libertarian themes. Like his father, Woody Guthrie, Guthrie often sings songs of protest against social injustice. He collaborated with poet Adrian Mitchell to tell the story of Chilean folk singer and activist Víctor Jara in song. He regularly performed with folk musician Pete Seeger, one of his father's longtime partners. Ramblin' Jack Elliott, who had lived for two years in the Guthries' home before Arlo left for boarding school, had absorbed Woody's style perhaps better than anyone; Arlo has been said to have credited Elliott for passing it along to him. In 1991, Guthrie bought the church that had served as Alice and Ray Brock's former home in Great Barrington, Massachusetts, and converted it to the Guthrie Center, an interfaith meeting place that serves people of all religions. The center provides weekly free lunches in the community and support for families living with HIV/AIDS as well as other life-threatening illnesses. It also hosts a summertime concert series and Guthrie does six or seven fund raising shows there every year. There are several annual events such as the Walk-A-Thon to Cure Huntington's Disease and a "Thanksgiving Dinner That Can't Be Beat" for families, friends, doctors and scientists who live and work with Huntington's disease. Guthrie resides in the town of Washington, Massachusetts, where he and Jackie Hyde, his wife of 43 years, were long time residents. Jackie died on October 14, 2012, after a brief battle with liver cancer. He also has a home in Sebastian, Florida. Guthrie's son Abe Guthrie and his daughters Annie, Sarah Lee Guthrie, and Cathy Guthrie have also become musicians. Annie Guthrie writes songs and performs, and also takes care of family touring details. Sarah Lee performs and records with her husband Johnny Irion. Cathy plays ukulele in Folk Uke, a group she formed with Amy Nelson, the daughter of Willie Nelson. Abe Guthrie was formerly in a folk-rock band called Xavier, and now tours with his father. Abe Guthrie's son, Krishna, is a drummer and toured with Arlo Guthrie on his European tour in 2006 and played guitar for the 2009–2010 Tour. Krishna plays drums in Modest Me and aspires to be the lead of his own band some day. Arlo Guthrie is a grandfather of Abe's son Krishna and daughter Serena, Annie's son Shiva Das (Mo) and daughter Jacklyn, Sarah Lee's daughters Olivia Nora and Sophia Irion and Cathy's daughter Marjorie Maybelle Midwood. Guthrie tuning up prior to a performance in Kodiak, Alaska in 2013. The fourth season of The Muppet Show. "St. James Infirmary" and "City of New Orleans"
1 2 3 4 Strong, Martin C. (2000). The Great Rock Discography (5th ed.). Edinburgh: Mojo Books. pp. 410–411. ISBN 1-84195-017-3. ↑ Guthie, Nora. "Woody Guthrie". Voices of Oklahoma. Retrieved 2012-05-21. ↑ Shavelson, Susanne A. "Aliza Greenblatt: 1885–1975". Jewish Women's Archive. Retrieved 2012-01-01. ↑ Tugend, Tom (December 2, 2004). "A Jewish Visit to Guthrie's Land". JewishJournal.com. Tribe Media. Retrieved 2012-01-01. ↑ Jones, Landon Y. (December 5, 1977). "Remember That Happy Hippie? At 30, Arlo Guthrie Has Done His Own Hard Travelin'". People.com. Retrieved 2014-04-18. ↑ Goldscheider, Eric (January 5, 2002). "In a Quest, Arlo Guthrie Is Back in That Church". nytimes.com. Retrieved 2015-03-22. ↑ "Karl Dallas". Morning Star. 30 June 2016. Retrieved 26 September 2016. ↑ "Courage of Conscience Award Recipients". PeaceAbbey.org. The Peace Abbey. Archived from the original on June 10, 2014. Retrieved October 24, 2012. ↑ Brock, Alice. "All About Alice". AliceBrock.com. Alice Brock. Retrieved 2012-01-01. ↑ Fisher, Marc. Something in the Air: Radio, Rock, and the Revolution That Shaped a Generation. p. 136. ↑ Thompson, Jennifer Trainer (2011). The Joy of Family Traditions: A Season-by-Season Companion to Celebrations. Random House. ↑ Doyle, Patrick (November 26, 2014). Arlo Guthrie looks back on 50 years of Alice's Restaurant. Rolling Stone. Retrieved November 29, 2014. ↑ Kasten, Roy (January–February 2001). "Arlo Guthrie: Outlasting The Blues / Power Of Love (Koch)". Not Fade Away. Americana and Roots Music – No Depression (31). Retrieved 2012-01-01. ↑ Guthrie, Alro. "Prologue: Words and Music by Arlo Guthrie". Arlo.net. Arloco Music Inc. Retrieved 2012-01-01. ↑ Marano, Richard Michael (2003). Vote Your Conscience: The Last Campaign of George McGovern. Praeger Publishers. p. 172. ↑ "Promotional flyer for "Rally for McGovern" on March 12, 1984, Copley Square, Boston, Massachusetts (Special guest: Arlo Guthrie)". Myspace.com. December 8, 2011. Retrieved 2012-01-01. ↑ Kronholz, June (January 29, 2008). "Group W Grad Endorses Ron Paul". The Wall Street Journal. Retrieved October 24, 2012. ↑ Solomon, Deborah (July 26, 2009). "Questions for Arlo Guthrie: Just Folk". The New York Times. Retrieved October 24, 2012. ↑ "Arlo Guthrie on 'Stupid' Politicians and 50 Years of Thanksgiving Classic 'Alice's Restaurant'". The Daily Beast. November 26, 2015. Retrieved November 26, 2015. ↑ Harrington, Richard (August 12, 2005). "Arlo Guthrie's Storied Career". The Washington Post. Retrieved October 24, 2012. ↑ Guthrie, Arlo (2004). Mooses Come Walking. Chronicle Books. ISBN 0-8118-1051-8. "Youths Ordered to Clean Up Rubbish Mess", The Berkshire Eagle (Pittsfield, Massachusetts), November 29, 1965, page 25, column 4. Reprinted in Guthrie, Arlo (1969). This is the Arlo Guthrie Songbook. Amsco Music Pub. Co. p. 39. Lee, Laura (2000). Arlo, Alice & Anglicans: The Lives of a New England Church. Countryman Press. ISBN 978-1581570106. Lee, Laura (2000). "Arlo Guthrie Convicted of Littering: November 28, 1965". Mass Moment. Massachusetts Foundation for the Humanities. Retrieved October 24, 2012.